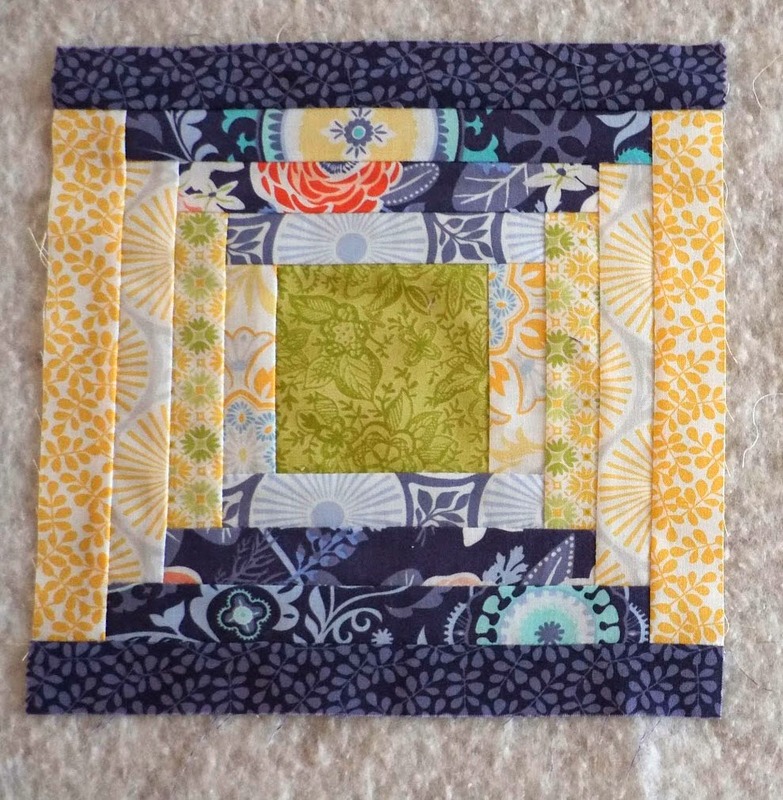 One of the topics we thought we could look at for our blog is an exploration of traditional blocks and a modern use of them. 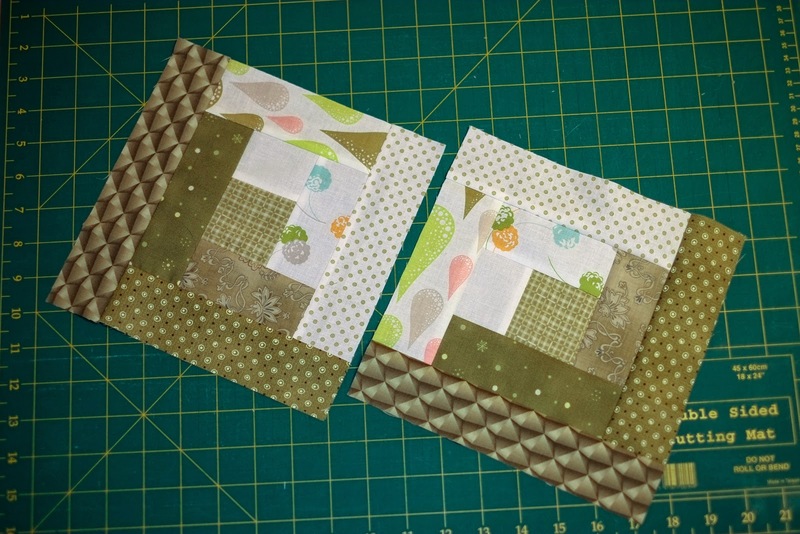 My very first pieced block (other than sewing charm squares together!) was a log cabin block. 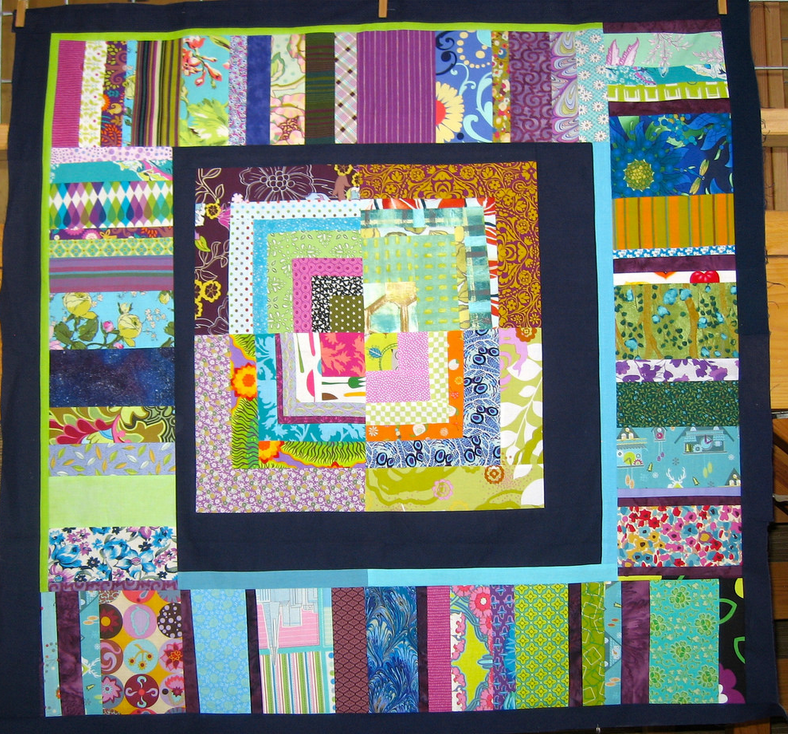 Forgive the wonky angle, taking photos of quilts in the wind is tricky! 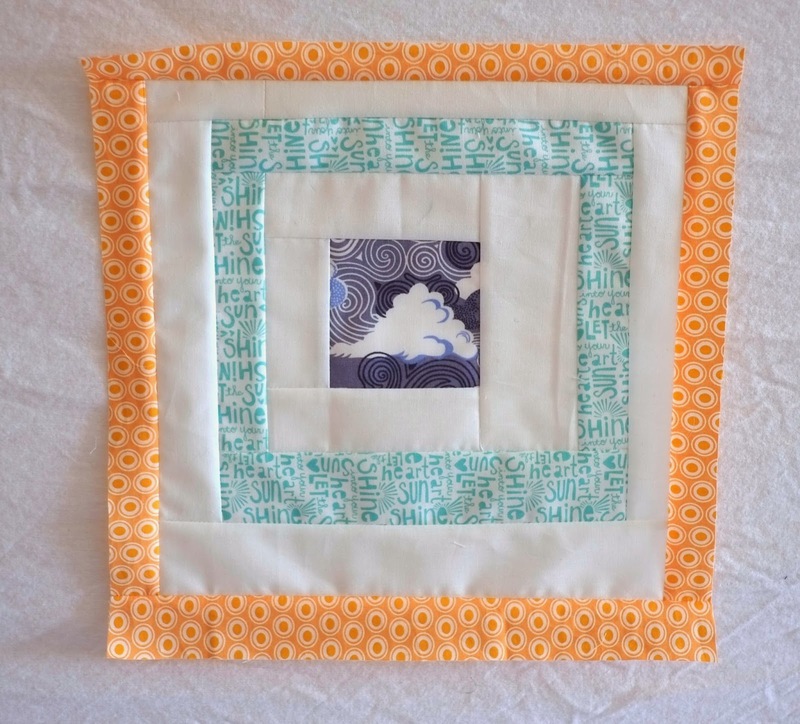 I made this as part of an online sampler course with Whipstitch. It is still one of my favourites though at the time I didn't find it that easy. 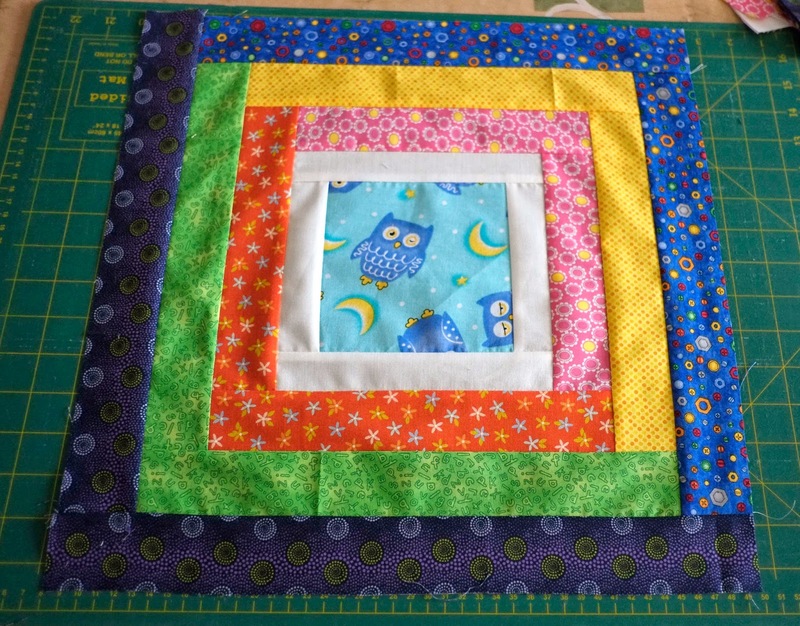 This 15" block required long straight seams with a consistent 1/4" and getting the colours placed in the right order. I have since learned that pesky 1/4"seam and discovered, when you want a straight line ram rod straight, foundation paper piecing is a good way to do this! 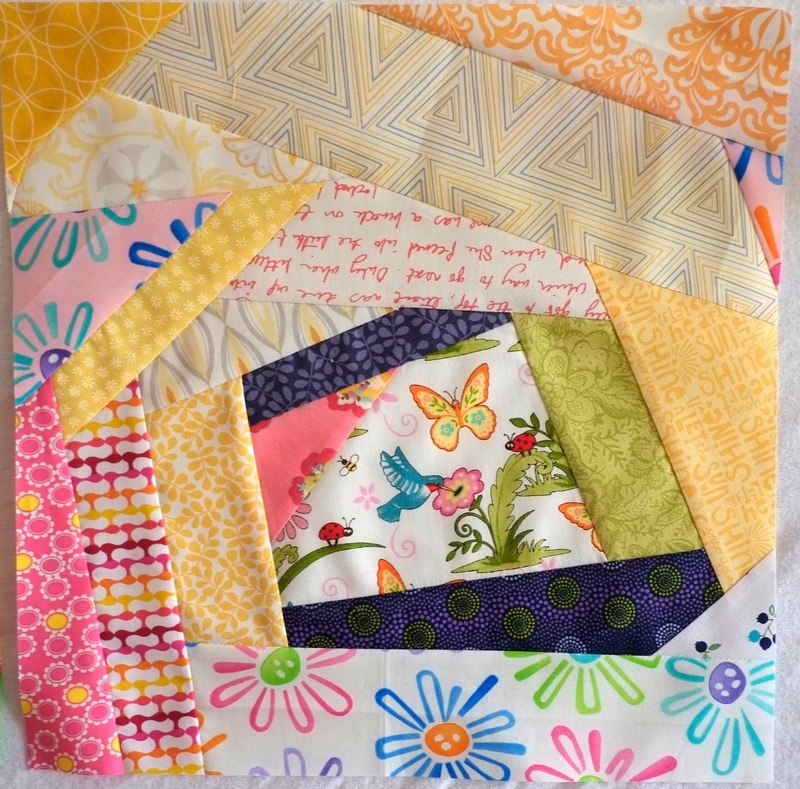 It is a good block to start with from a quilting history perspective and makes you feel connected to a long tradition of patchwork piecing. I learned the light and dark represents the ups and downs in life and the that the traditional log cabin has red or yellow at the centre to symbolise the hearth of the house and the warm welcome that awaits you there. Coloured or fussy cut centre. With one side of the block usually made from light and the other dark, you get great contrast when multiple blocks are put together. Using this colour placement gives rise to many settings. 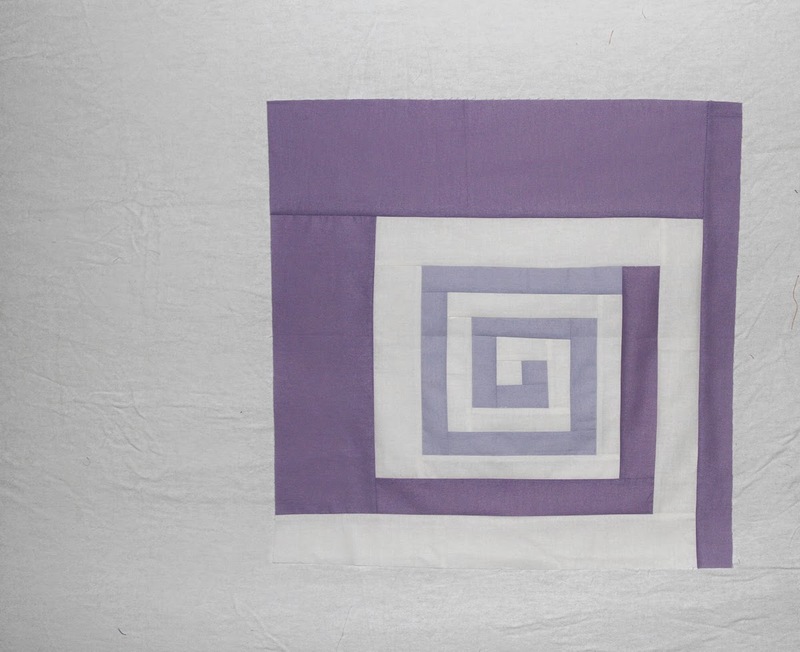 Check out these links from Piecemeal quilts and Connecting threads to see some combinations and the wonderful names they've been given, like Fields and Furrows and Streak of Lightning! 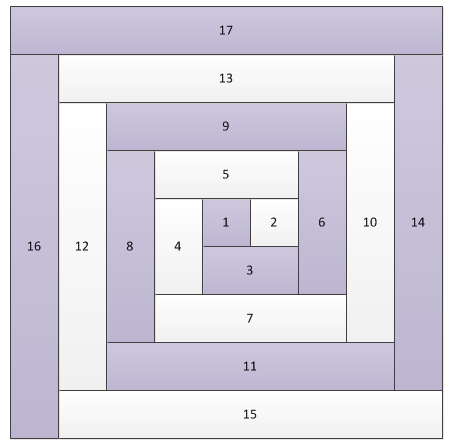 Instead of light and dark though how about this spiral version using only 2 colours. 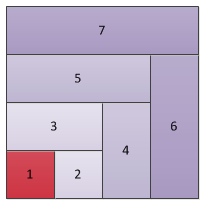 Varying the width of the strips surrounding the centre gives a really nice offset effect too. And this one based on the courthouse steps version of the block, which is made building the blocks 2 sides at a time. Film in the Fridge has a great tutorial for a really modern looking block using the courthouse steps principal, called Converging Corners, that is worth a look. Half log cabin though in my head this is more of a quarter. 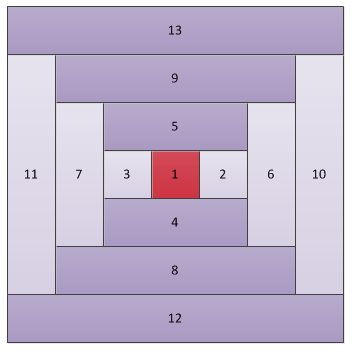 Some people call it a Chevron block. My first time making a log cabin I inadvertently ended up with one of these. I put all the lights on at the same time instead of going around. Still it's a happy accident, make 3 more and you have a Bento box block! Fine Diving has some really colourful Bento box examples here. How about Wonky? 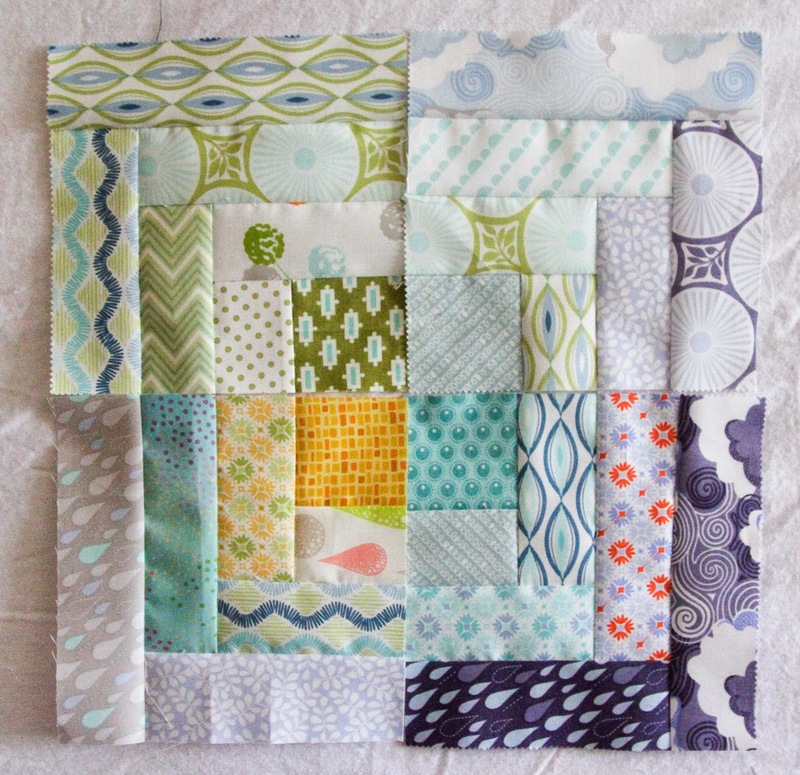 Anna our May Queen for the Modern Irish Bee chose a wonky log cabin style block for her month and the instructions and tutorials links to make this are here on our Blog page. 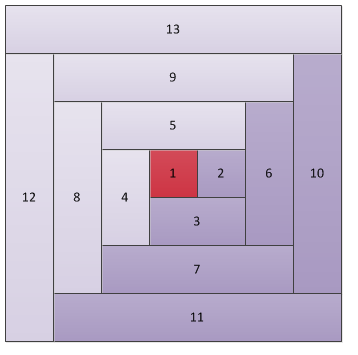 And lastly you could apply the same principle to a shape other than a square. How about a triangle or even an octagon? There's a link to a hexagon tutorial on our Facebook page if you want to try it out. 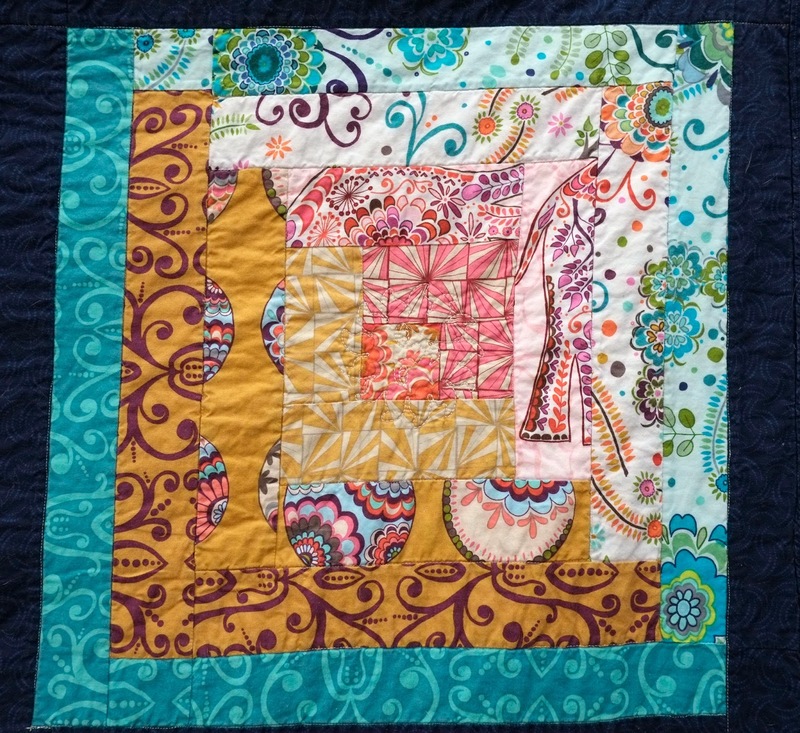 Combining some of these concepts all together take a look at this wonderful quilt top Jody made for our Modern Medallion-A-Long. If you have any log cabin variations to share please add them in the Flickr group or Facebook page. If you are sharing on Instagram please tag with #modernirishquilters so we can find them. We'd love to see your log cabin projects or any other variation of a traditional block!